Reference number for this case: 16-oct-54-Sedan. Thank you for including this reference number in any correspondence with me regarding this case. We announced yesterday that several people saw a luminous spot of round form, above the area of Sedan, Saturday in the evening. We did not want to give an exaggerated importance to this news, at a time when minds are influenced by the accounts related to strange appearances. But the fact that this luminous spot could be fixed on photographic film obliges us to come out of our reserve. The documents which we publish are absolutely authentic and they are by no means about trick photographs. These two photographs were taken Saturday at about 10 P.M. (the witnesses, in their emotion forgot the exact time) from a window of a building of Jean-Jaurès street in Sedan. Two witnesses were with the photographer. It is this latter who, wanting to take some air at the window of his room, was the first to see this abnormal gleam which intrigued other witnesses, in different places. Two policemen, in faction at the Sports Stadium, saw a luminous disc, at about 09:30 P.M.. Several young people, coming from the direction of Vrigne also saw it. When the photographs which we publish were taken, their author was unaware of any of the other observations. These two photographs were taken with a "Sem Flex" 6x6, opening 3.5; exposure time: 1 second for the first and 2 seconds for the other; "Per Omnia" 23 filmstrip. The smaller spot is the moon which reached its second district yesterday evening. The luminous disc, definitely larger than the moon, strongly impressed the film. On the enlargings one clearly distinguishes an obscure central core in the middle of the luminous disc. A photograph had been taken by an amateur on the side of the "Moulin à Vent" ("Windmill"). Unfortunately, the exposure time was too short: 1/100th of a second, it did not provide anything of value when developped. I read your article supported by several photographs of the "FLYING SAUCER" of Sedan with much interest. In the torpor of this gentle autumn evening, ATTIGNY was too indifferent to realize that strange tourists visited the Ardennes sky, scorning our tourist offices and even our cooking specialities which are however quite enticing. As this gentelman in Sedan breather the air at his window, observed, and had time to take photographs, I took the air too in my garden, Saturday evening at 09:30 P.M. Maybe the time and the temperature were admirably suitable to that. My presence could not have been more convenient, if I had taken rendez-vous at a contradictory meeting, in which I was decided to oppose my absolute scepticism. And yet I very clearly saw it pass - my eyes staring at a constellation at the south - in front of the latter, at an exceptional pace, a luminous sphere, very bright, followed by a long trail which could have been the exhaust of a powerful jet, or more simply, the heating of cosmic dusts caused by speed. All my attention was focused at the passage of this bolide which went with grace in an impressive silence. This fireworks lasted only 3 or 4 seconds, limited as I was by the portion of the sky ranging between two groups of buildings. We can only congratulate you for your impartial effort  your fitting reflexions. It is indeed too simple to ridicule events which one does not know but about it is discussed more and more. The most difficult task for a journalist is to make this discrimination between the illusionism, mystification and reality. It may be lightheartdly, even with liveliness, joked at it, but it would perhaps also be useful to encourage sincere testimonys in order to correctly inform the readers about a course of facts which have nothing tenderizing enough to be compared with love stars; and which deserves a serious attention. In its fugacity and silence, this phenomenon could be seen only by chance, exactly as one wins with the national lottery. (That did not happen to me yet). Here, the chances could be easily increased by setting up groups of qualified and perspicacious observers. It was turnover time at the Sugar Refinery of Attigny, the night shift was on its way. Among those, I found witnesses who have been marvelling at this beautiful comet. 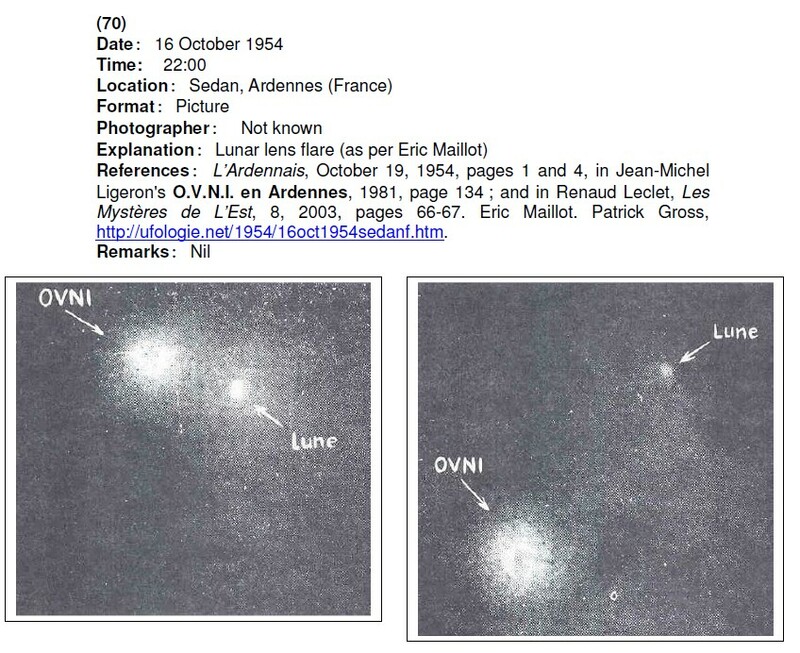 Eric Maillot re-examines the cases noted by Jean-Michel Ligeron and indicates that the cases for October 16, 1954 at 09:15 p.m. in all the department of the Ardennes were caused by a meteor probably of the Taurids, "radian in the East." REFERENCES: L’Ardennais, October 19, 1954, released in Jean-Michel Ligeron’s O.V.N.I. en Ardennes, 1981, page 134. Eric Maillot. 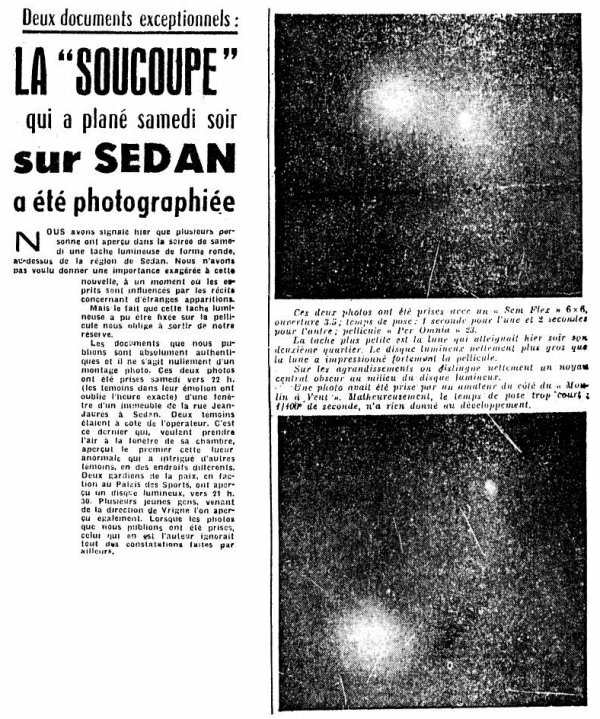 Jérôme Beau reproduces the transcription and the scan of the article in L'Ardenais, October 23, 1954, indicating as source "Gross, P.: '16 OCTOBRE 1954, SEDAN, ARDENNES:', Ufologie.net, May 15, 2004". Luc Chastan indicates that in the Ardennes in Sedan on October 16, 1954 at 21:30 hours, "Observation by many witnesses of a luminous spot of round form. Two policemen, on guard at the Sports stadium, speak about a luminous disc. This luminous disc was in the sky at the same time as the Moon, but was much larger. An obscure core could be seen on the enlargings of the photographs which were made of this appearance." And: "The small spot is the Moon" in caption of the picture from the newspaper [ar1]. The source is said to be my website, as "Les OVNI vus de près by Gross Patrick ** http://ufologie.net". 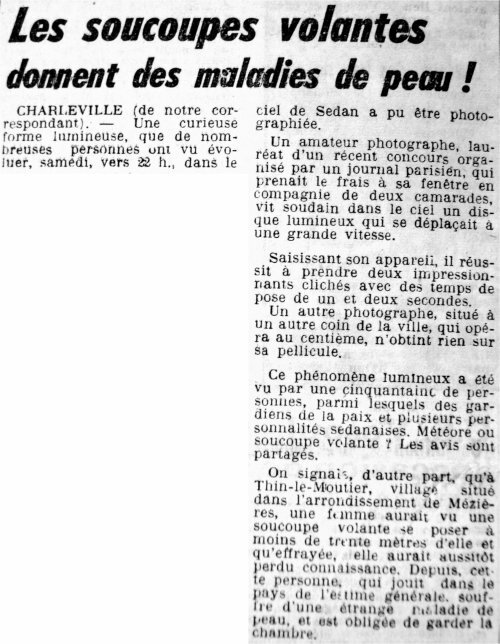 [ar1] Article in the regional newspaper L'Ardennais, Charleville, France, page 1, October 16, 1954. [ar2] Article in the regional newspaper L'Ardennais, Charlevilles, France, October 23, 1954. [---] "OVNIS en Ardennes - 10 Ans d'Enquêtes sur les Soucoupes Volantes", livre par Jean-Michel Ligeron, Jean-Michel Ligeron éditeur, page 134, 1981. [em1] "Examen critique des cas cités dans 'OVNIS en Ardennes' de J-Michel Ligeron", article par Eric Maillot, dans Les Mystères de l'Est, CNEGU éditeur, #7, page 2/11, 2002. 0.1 Patrick Gross May 15, 2004 First published. 1.0 Patrick Gross December 26, 2009 Conversion from HTML to XHTML Strict. First formal version. Additions [bo1], [jb1], [lc1]. 1.1 Patrick Gross January 17, 2010 Addition [jd1]. 1.2 Patrick Gross December 2, 2016 Additions [er1], [ub1].